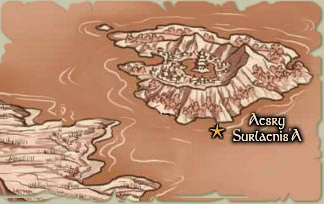 Aesry Surlaenis'a is the capital city of the island of Surlaenis. Its location in the lush interior of the remote and rugged island has isolated it from many historical events. The mist that both shrouds the encircling cliffs and covers Cha'Walkas, the lake that the city in turn encircles, add an ethereal quality to the beauty of the city. Play.net Description: Among its many spiritual treasures, Surlaenis harbors the only surviving enclave of the Ru'atin Peri'el, a sect of S'Kra women who sing ritual lullabies to keep sleeping evils from reawakening. Ruled by the Tribunal Council. Members of the Council include Etta, Aranis, Urdain and Chiarik. Derrien Margate commands the Tribunal Navy while Chiarik commands the Tribunal Army. For thousands of years back into the mists of time, Surlaenis was exclusively S'Kra Mur, dominated by two great clans Sraan Venda and Sraan Mehath. Sraan Venda, Ring Clan, controlled the steep and rocky outer portions of the island while Sraan Mehath, Wind Clan, ruled the high mountains and the green inner slopes. Once this division had been established, the two clans lived in harmony and became close allies. Around 2300 BL, the leaders of magically powerful Sraan Mehath received a prophecy that faced them with the choice of rising to become the most powerful of the S'Kra clans for a thousand years or to fade into obscurity forever. But the price for the thousand years of glory was that they had to leave behind their beloved island and find their fate upon the mainland. The deliberation was short and the entire clan packed up and left for the mainland. Although this technically left Sraan Venda in sole control of the island, they were an extremely traditional clan and set in their ways. For the most part, they kept to their ancient territory and did not move to occupy the lush interior. When Sarkhhl rose to power on Reshalia two hundred years later, Sraan Venda was the first of the clans not native to that island to recognize the validity of the new king. A deep and lasting trust was formed between the king and the clan, to the point that the unoccupied land in the center of island was ceded to the kingdom, expanding its territories to include a large portion of Surlaenis. The remoteness of the island prevented any massive development of the land, but some farming was undertaken to help support the kingdom. In 1605 BL King Urhhsu of Ratha had gathered together the leaders of all the S'Kra clans to sign an accord that would become known as the Urhhsu Code. The Code is a loose assemblage of rules and ethics that define the relationships between the clans, including rules of diplomacy and warfare. Although it is seen as a great step forward for S'Kra civilization, and the culmination of some fifty years of negotiations, the King had to pay a steep price to get all the parties to ratify it. For the Code to make sense, one of the things it had to do was define what conditions had to be met to recognize a group as a Sraan. By the new definition, Sraan Venda did not meet the qualifications and could no longer be legally recognized as such. So, despite being close allies of the King, Sraan Smolg, and Sraan Mehath, Ring Clan was signed away into obscurity to get the Code accepted. With the Elven-Human War, great numbers of Elothean and Elven refugees fled the mainland and migrated into Qi, but found little welcome. While some blame the ruling S'Kra Mur for being insular and xenophobic, the inhabited islands of the archipelago were already supporting as many as they could. Instead, the refugees split into two groups, one settling M'Riss and the larger second group making the trip to Surlaenis around 1000 BL. The large group of refugees came by invitation from the remnants of Ring Clan. Although they were no longer legally a clan, they still had control of the island and their clever leader foresaw the new peoples as a way of rebuilding Surlaenis as an important island. The refugees were initially dismayed by the rocky and rainy outer shores of the island, but when they were led through the great pass to see the lush green paradisaical interior, they were amazed and thankful. They set about building a great city in the center of the bowl-like interior, naming it Aesry Surlaenis'a. While the island was technically brought into the Seven Star Empire with the rest of Qi in 878 BL, it almost never appears in Imperial history, buffered from the rest of the world by its remoteness. While the Empire did keep a garrison of troops on the island, and constructed a lighthouse on the west end of the island to assist trade, the island was otherwise ignored. Far from feeling snubbed, the people of Surlaenis took the time to create a unique culture from a fusion of Elothean, Elven, and S'kra Mur elements. After the fall of the Empire, much of Qi fell into chaos and piracy became rampant. The largest and boldest of the freebooters would even dare to raid inland upon the islands, and the rich city of Aesry Surlaenis'a was one of their targets. Frustrated, the most prominent families of the island turned to the Warrior Mage guild for assistance in 205 BL. A year later, construction was begun on the Grey Tower, followed by the White Tower some twenty-five years later. Built to protect the single pass leading to the interior of the island, the towers are jointly known today as the Sentinels. The construction of the Sentinels was extremely fortuitous, as the Dragon Priests invaded Surlaenis in 160 BL. After landing, they found themselves faced with the final vestiges of Ring Clan, who were wiped out in a three day battle that slowly moved up the outer slopes to the pass that led to the interior. The Dragon Priests finally reached the Sentinels, but they could not force a passage beyond them, so they laid siege at the pass; a siege that would last for one hundred and sixty years. Cunning strategies would be attempted by both sides to break the stalemate and great battles would be fought in attempts to dislodge either force, but nothing would answer. Since the collapse of the Dragon Priest Empire, the island of Surlaenis has for the most part existed in peaceful isolation. Aesry is home of the only remaining sect of the Ru'atin Peri'el. The Halasa Temple at the center of Cha'Walkas is dedicated to Eluned and her aspects. The Stones of the Cloud are located at cardinal points around the lake, and Clerics may touch them on the corresponding solstices or equinoxes to commune with the gods. A headstone in the Necropolis bears the name of the Necromancer Velmix. There are altars to Murrula and Meraud out near the Cleric Guild. Chadatru's altar is near the Wisdom library. Idon has a shrine in the Morgue. Intrepid adventurers can seek Peri'el's favor in the Highlands, while Lemicus has a shrine in the Halasa Temple at the center of Tethloren Island. The northern crescents of the city are visible from this vantage point several hundred feet above the lake. Ending abruptly at a flight of basalt stairs, a pathway of crushed red and white shells curves around an ancient oak tree. The ancient tree is decorated with hundreds of colored ribbons, each intertwined with one other. Surlaenis custom requires a couple to tie a ribbon to the tree at the time of their engagement, and to intertwine that ribbon with another on the day of their marriage. [You can TIE MY RIBBON TO TREE to add your ribbon. Must be a ribbon. Ribbons do not work. This page was last modified on 1 March 2019, at 19:12.